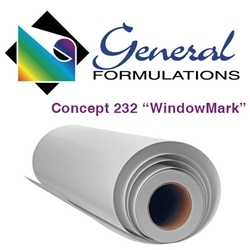 Concept 232 is a 6.0 mil white front side and black adhesive side flexible vinyl film with a clear removable acrylic pressure sensitive adhesive on a 84# layflat line. This film is designed to accept a variety of solvent-based inks, including ecosolve, common to wide format digital printing. The removable pressure sensitive adhesive is designed for excellent compatibility with vinyl films to give clean removal from glass. The two layer perforated liner system allows for UV digital printing of this product. This product is designed for production of see through graphics for windows. Open area is approximately 50% with a hole size of .060 inches (1.5mm). Recommended for use on flat vertical vehicle windows or commercial store windows. In use this product is applied to the exterior glass surface. This surface must be clean to assure adequate product bond. Do not use solvent or ammonia based glass cleaners for cleaning. When this product is used on vehicles some states have a minimum light transmission regulation. The use of this product is responsible for complying with these regulations.